I made Notebook Addict of the Week on Notebook Stories!! Awesome!! I feel like I've just entered a VERY exclusive club. Thank you Nifty for including me! 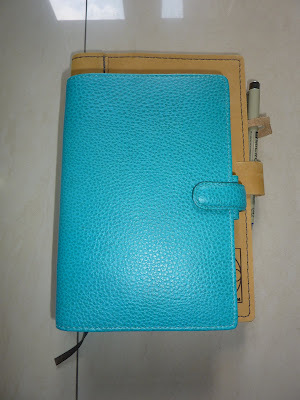 Check out the post about my official addiction HERE and be sure to read other excellent posts on the Notebook Stories blog HERE. Right now at the beginning of the school year I want to put systems in place that will keep me organized all school year long. This is my first year with both kids in school, and I already know that the art and papers they bring home will quickly get out of control if I don't set up systems now to deal with them from the very beginning! I already have a folder for each child to hold class newsletters and information from the school, so that's set. My big dilemma is how to deal with art, writing and other "creations" the kids bring home. I want to keep everything they bring home until the end of the school year, then I'll go through it all and decide what to keep. So, experienced Moms, what's my best bet? Should I get a bin or basket for each kid and put everything into it? Or is there some kind of binder system that would work better? My other issue is what to do with their backpacks, library books, ongoing projects and such. Our walls are solid concrete so I can't install hooks in the walls, but I can use tables, shelves and/ or racks for such things (although I don't have major retailers like Target or Ikea so they have to be something made out of wood, which I can have made for cheap here). I would appreciate any ideas for keeping school items organized and under control. Please post a comment! Hey everybody! 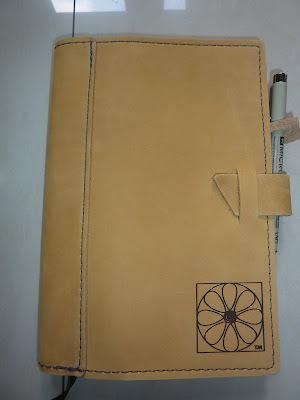 Are you starting to fill in your 2012 planner yet? I know many of us who are on an academic year schedule are filling in the school year in our 2012 calendars. I like being able to plan the entire year so I write in school breaks as soon as I know them. I like to write in my new planner(s) as soon as I can. I love filling in dates in a new planner! As soon as I know any events they get written in, and annually-recurring dates like birthdays and anniversaries go straight into my new planner. As I wrote in my previous post, this sometimes comes around to bite me when plans change! Do you fill in dates in next year's planner as soon as you can? Or do you wait until the year starts? 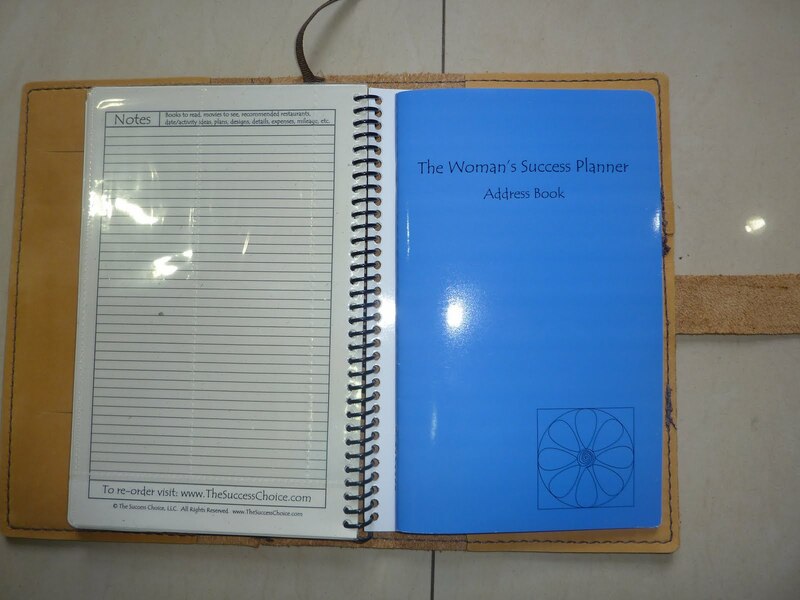 Here is my new brushed leather cover for my Woman's Success Planner! The color is listed as "sunrise yellow" but don't expect a bright artificial yellow, it is a natural yellow-tan. These photos are are pretty good representation of the color, on my computer at least! 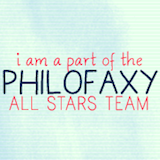 Click here to read the meaning of the logo. Click here for the cover's product page for more specific information. Below is the cover open and empty so you can easily see the interior layout. (Click on the photo to enlarge.) 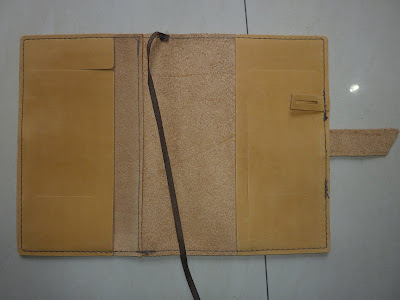 The left cover flap has an opening where you can tuck in papers. Below that is a slot for cards. 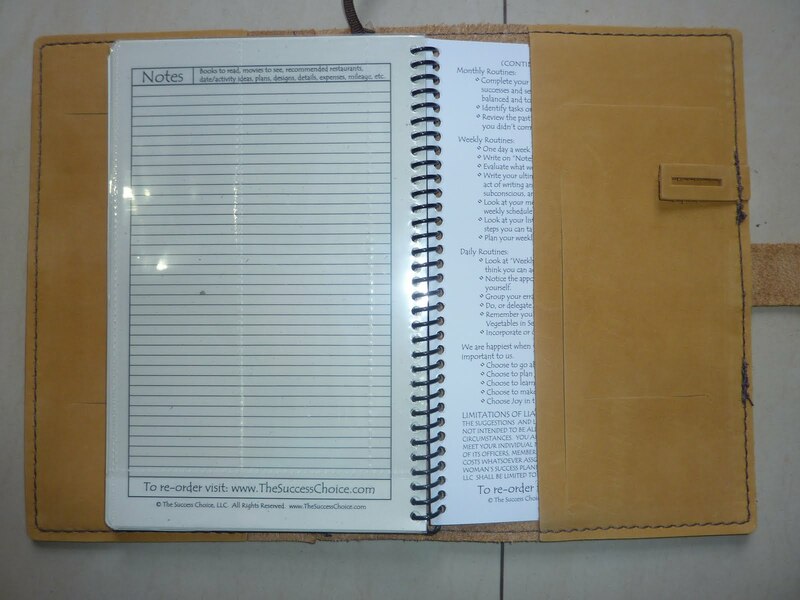 There is a ribbon placemarker sewn into the top of the cover to conveniently find your page. On the right side there is a slot at the top where a slim jotter pad could slide in, a vertical slot to slip in your checkbook, and below that another card slot. There is a pen loop that is not elasticated, so slimmer pens can clip on with their clip. 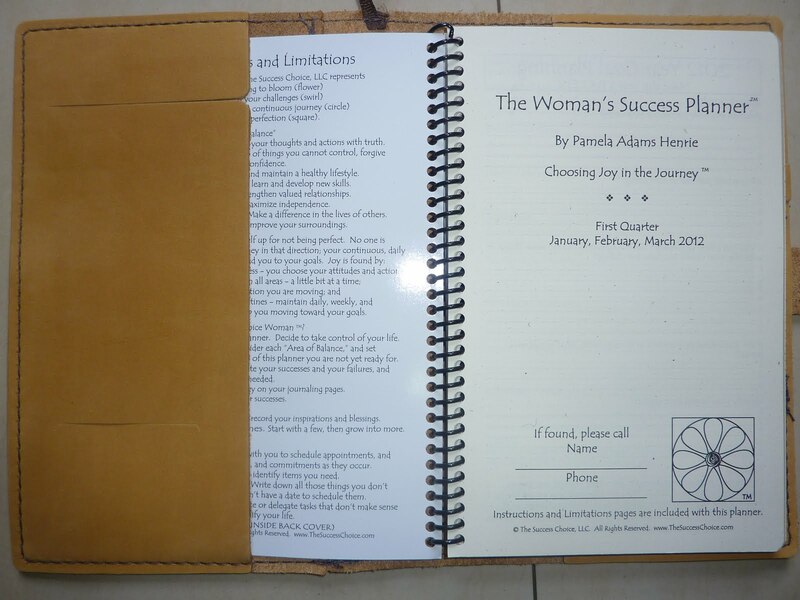 The closure tab slides into a loop in the front cover. I love to play with the closure flap, it is soft like a puppy's ear! Here is the back of the cover. At the bottom you can see the logo Rustico, Made in the USA. All Success Choice products are made in the USA. 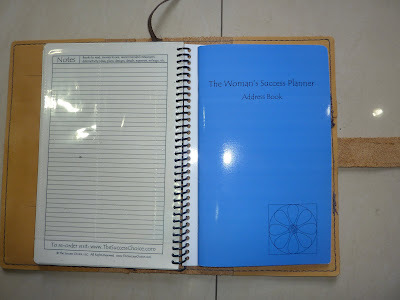 The cover is designed to also fit the Address Book (click here for my review and lots of photos of this not-just-an-address-book!). 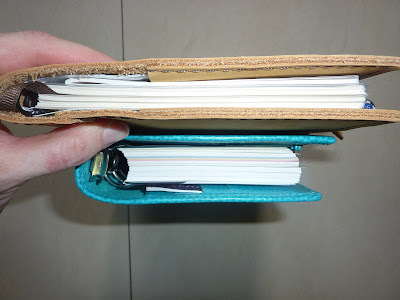 I didn't take a photo of it, but you can actually fit two of the quarterly planners into the cover at once (along with the address book), so you can plan 6 months at a time. I'll be doing this in the last week of the quarter so I can plan ahead to the next week and month. And definitely slimmer, even with the address book in it too. 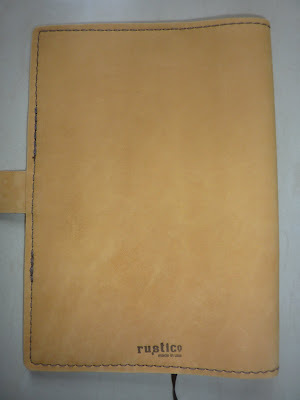 I love the cheery yellow color and the soft feel of the brushed leather. It makes me want to hold it all the time! 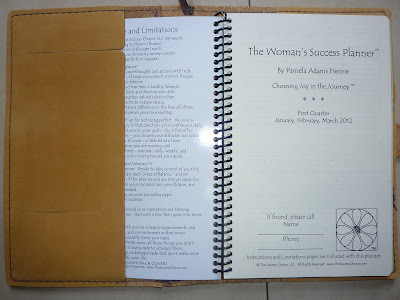 Pamela, the creator of Success Choice planners, uses this exact cover herself, and she says the brushed leather gets softer over the years. When I first put the cover on my planner I thought to myself, "Just when I thought I couldn't love my Success Choice planner any more, now I do!" I am a big believer in the idea that things we use every day should be as pleasant to use as possible. 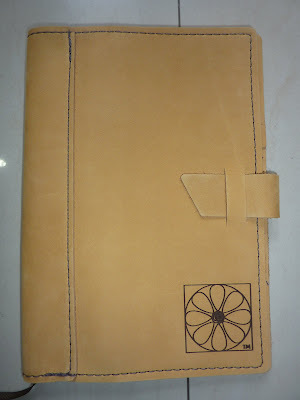 This cover is so soft and beautiful (and has that nice leather smell) that it really adds to the enjoyment of using my planner, especially since I handle my planner so often throughout the day. I ordered this cover from The Success Choice, click here for the product page. The covers are currently on sale for 25% off, and US shipping is included in the price. 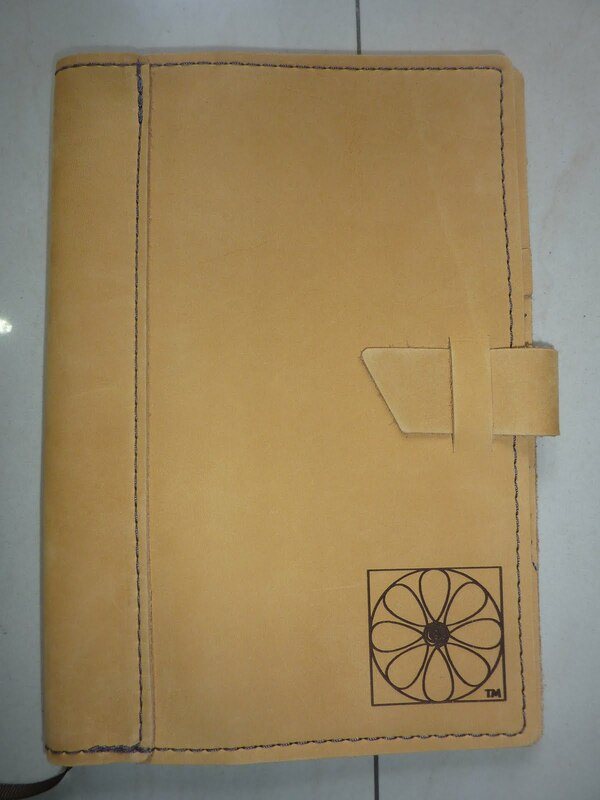 The covers also come in black, carmel brown, chocolate brown and cranberry, click here to see all the Success Choice leather covers.